Motherwell's match with Hibs at Fir Park has been brought forward 24 hours. The SPL have upheld Motherwell’s complaint over the scheduling of their home fixture against Hibernian on May 6. 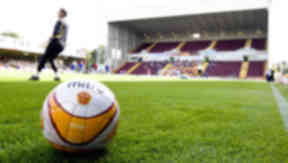 The Fir Park side have had the match brought forward 24 hours due the election taking place on the same day. Hibs’ visit to Lanarkshire was set for the Thursday, chosen with TV schedules in mind, but the match will now take place on Wednesday, May 5. A statement on the Motherwell's official website read: "Knowetop Primary, adjacent to Fir Park Stadium, is a key polling station in the Motherwell area. "With the election vote taking place on the same evening, the club raised issues over safety, congestion, resources and the ability to vote - all of which were accepted by the SPL, Hibernian FC and our satellite broadcasting partner, Sky Sports." The change of date was a small concession for the Steelmen after being outraged at their post-split fixtures, which will see them play only 18 games from 38 at home. Chairman John Boyle has called for financial compensation from the SPL over a number of issues surrounding their fixtures after the team unexpectedly qualified for the top six. The club has estimated they could lose as much as £200,000 by being handed one less home, missing a second visit of Celtic and being asked to play home games at inconvenient times. Just 3,544 supporters attended their 3-2 defeat by Dundee United, which was screened live late on Sunday afternoon.